When looking to buy a birdhouse there is actually more information you should know then you think. In this article I will be outlining the most important information to know when thinking about buying a birdhouse comes to your attention. Some of the things to think about are what kind of birds live in your area, what height should your birdhouse be at to keep them safe from predators, how big should your birdhouse be, what material is best for a birdhouse to be made out of, and lastly why you should have a bird house in the first place. Where you live is an important factor into buying a birdhouse. If you live somewhere you will be dealing with bigger breeds of birds you will want to look into possibly buying bigger birdhouses. If you live in an area where the birds are relatively smaller you wont have to worry about that. Amazon is a great place to search for this as it sells many different kinds of birdhouses and also sells books on how to actually build your own birdhouse in a fast efficient and inexpensive way. The height that your birdhouse should be put at is also very important. Some people want to make them relatively short so they can see the birds as they take shelter. The only issue with this is that birds have prey on the ground and the last thing you want is for a cat or other predator to easily be able to reach the bird as it is inside the house you have either bought or built for it. To be safe a height of at least four meters should be a safe height to build your birdhouse. Another feature you might want to have in your birdhouse is two entrances. This way if a predator does get near the birdhouse there are alternate exits for the bird to escape. The size of your birdhouse is also relevant to the area that you live. 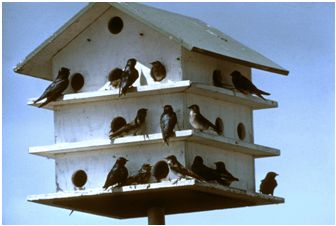 If you live in the middle of a subdivision you most likely wont need a very big birdhouse because there are most likely not many birds that are going to be around to use it. However if you live in an area surrounded by woods or brush then you might need a slightly bigger birdhouse as the amount of birds living in that area will be much more then say in the city. Now the material you make your birdhouse out of is up to you, and again may depend on where you live. Some people might want to make their birdhouse out of scrap metal as a side project. There is nothing wrong with this but you might want to think about it if you live in an area that snows. Metal in the middle if winter would be quiet cold for a bird to take shelter and wood may be a better option in this case. Again all of this information can be found on websites like amazon and will have a large variety information that could be valuable to you when looking to buy a birdhouse. Most birdhouses however are made out of wood. Just be sure that the wood is strong enough to hold up in bad weather. The last thing you want is to build a birdhouse that breaks when a bird needs it the most. Why have a birdhouse? Well there are a couple good reasons to have them. First off with the amount of developments that towns and city’s are doing these days they need to chop down trees. While chopping all of these trees down they are taking away homes for many birds and other animals. Building birdhouses gives them somewhere safe to stay. Birdhouses also look good as decorations on your lawn or garden, and can make your house look more welcoming. Lastly, Birdhouses can also be equipped with feeders. So not only can you give birds shelter but you can also feed them ensuring that they stick around even though most of the trees in your surrounding area may be gone. In conclusion Birdhouses are something that most homes should have, whether you live in the woods or in the city. Birds are always looking for a place to stay. Amazon is a great place to start looking when you are thinking about buying or just looking for information on birdhouses. All species of birds need the shelter and by creating that for them you are helping not only them but the environment as a whole.